Last night was a revelation for me. I’m not joking. 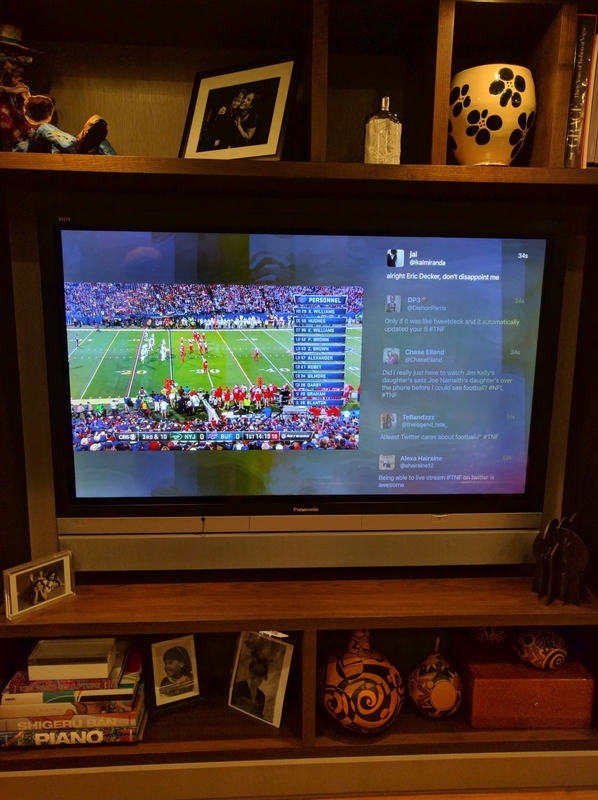 I wasn’t really expecting to be blown away by the experience of watching football on Twitter. I was. I was talking to folks on Twitter throughout the game and many said that they don’t understand the difference between having the tweets flowing up on the screen vs on your phone. For me, it’s a huge difference. You can watch the game and follow the conversation about it without having your head in your phone. But there is so much more Twitter can do to make this experience even better. For starters, I would like to be able to log into the Twitter AppleTV app and then have options to only see tweets from people in my timeline or to have those highlighted or prioritized. And, I would like to be able to use the Twitter app on my phone to control the AppleTV Twitter app like the Apple Remote app controls the AppleTV. Then I could tweet from the AppleTV app and be able to reply and engage right up on the screen. I expect Twitter to showcase all sorts of live sports in the coming months in their apps. You can watch these events on your phone in your Twitter app. Or you can watch them on AppleTV and XBox and, I think one other device. I expect Twitter to add apps for other devices as well. Everyone here at AVC knows I am a huge fan of Twitter and very long on the stock. So take all of this in that context. I think the addition of live content to Twitter is a game changer for them. It amplifies what is unique and different about Twitter and the experience is fantastic. Well done Twitter.